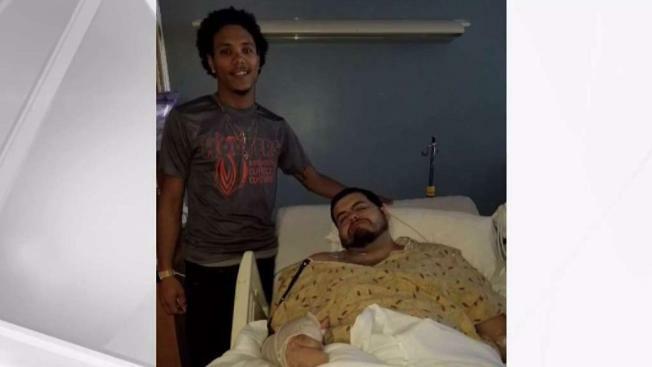 The father of a victim who was injured in the Jacksonville mass shooting set out to thank the man who saved his son during the chaos. NBC 6's Dan Krauth reports. Jacob Mitich had made it to Round Two of the Madden NFL 19 tournament in Jacksonville, and had almost scored a touchdown when the shots rang out. Vaulting over a table, he scrambled to exit the crowded room. At first he ran outside to the waterfront where he and friends had watched dolphins the day before. Thinking the shooter might follow, he sprinted for a few more minutes while operating on pure adrenaline. "That's when my leg started to hurt bad. I thought it was cramping. I went to grab my left leg and there was blood everywhere. I'd been shot." Mitich was one of 10 people injured on Sunday during the esports competition. Three died, including the shooter. Now, Mitich is filing a lawsuit against the game developer that held the tournament, the pizza parlor that hosted the event and the mall where it was located. "We're sitting there playing a video game, we shouldn't have to worry about someone coming up behind us and shooting us," said Mitich, a 23-year-old college student from Fallston, Maryland. Mitich and his attorney filed suit in circuit court in Duval County on Thursday, and spoke exclusively to The Associated Press by telephone. A longtime Madden gamer, he and other elite esports players went to these kinds of events not only in hopes of winning money, but to catch up with their tribe of gamers. When he met up with his friends on Friday night, they went to check out the tournament space at Chicago Pizza, the restaurant and bar inside The Landings waterfront mall in downtown Jacksonville. "We were all laughing because of how small it was," he said. He and his friends went to Hooters that night, then went to the tournament all day Saturday. It was so crowded that they had to compete in groups of 10, and people couldn't easily watch their friends play. That evening they stayed out late, and on Sunday, everyone rolled into the tournament area around 10 a.m. Sometime that morning, a 24-year-old former champion gamer named David Katz lost, but didn't make a big deal about it and few people paid attention. "He didn't like to communicate, he was antisocial," said Mitich. "The previous year he'd won Buffalo Bill club series. I didn't think he had a reaction to winning or losing." Then it was Mitich's turn. It was Round Two, which meant he was advancing in the tournament. His friend, Taylor Robertson — a 28-year-old West Virginian known in the esports community as "Spot Me," after his twitter handle @spotmeplzzz — stood behind and watched. Mitich made one play on offense and almost scored. "Pop pop pop. I thought it was a balloon. I didn't know what it was," he said. He heard someone say the word, "shooter," and that's when he ran. Katz was the shooter. Three people are dead, including the suspect, after a mass shooting at a "Madden '19" video game tournament in Jacksonville, Florida. Robertson was right behind him, or so he thought. As Mitich discovered that he was shot, a passerby helped him hobble to a nearby office building, where a security guard let them in. Mitich's injuries weren't life-threatening — he was released from the hospital that night and flew home Monday morning. His friend Robertson, however, had been fatally shot. Mitich's attorney, James Young with Morgan & Morgan in Jacksonville, said the lawsuit alleges negligence. There was no off-duty officer for the event, which drew more than 100 people, he said. The mall had a private security guard, and she was spotted in the pizza place before the shooting, but Young said it's unclear where she was during the shooting. On Wednesday, Jacksonville fire inspectors shut down Chicago Pizza. A city code violation report says the restaurant didn't have a permit to hold the Madden NFL 19 tournament. Also, The Florida Times-Union reported that the restaurant's last approved building layout was submitted in 2009. Fire inspectors said the layout was altered without approval to create the GLHF Game Bar, the room where the tournament took place. The restaurant's voicemail was full on Thursday, and a message on Facebook wasn't returned. When reached for comment, a spokeswoman for The Landing didn't directly respond to the allegations, saying instead that the company is cooperating with authorities. Young said the suit also is seeking relief from Electronic Arts Inc., the game developer, to provide safe spaces for tournaments. The lawsuit said Electronic Arts failed to provide security, screen the gamers, inform local law enforcement about the tournament or tell the gamers anything about the venue. Similar claims about security were made against other defendants. Electronic Arts didn't respond to an emailed request for comment, but in a statement earlier this week, CEO Andrew Wilson said they were cancelling all scheduled Madden qualifier events "while we run a comprehensive review of safety protocols for competitors and spectators. We will work with our partners and our internal teams to establish a consistent level of security at all of our competitive gaming events." Four days after the shooting, Mitich is hoping to begin college a week late. But memories of his friend Robertson haunt him. "His life ended watching me play Madden."